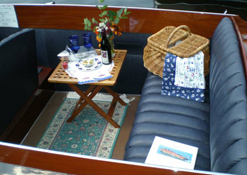 Here at Nordby Upholstery and Canvas, we take pride in delivering the best custom boat interior and custom boat covers Brainerd Lakes has to offer. We also specialize in creating one-of-a-kind, custom porch curtains and awnings Brainerd Lakes folks simple love. We are a company with over five decades of in-depth knowledge and experience in the business. We have built our solid reputation on the consistent delivery of outstanding products with a strong focus on detail and high quality workmanship. We take the time to listen to our clients and understand exactly what it is they need and expect from us. Here at Nordby Upholstery and Canvas, we don't believe in taking shortcuts as far as service goes. We know the value of providing excellent services day in and day out. Using only the best materials and methods to come up with remarkable products that are nothing short of being works of art, our clients' satisfaction is always at the top of our priorities. If you, or someone you know, are on the lookout for top quality custom upholstery that's tailored to your needs and are sure to exceed your expectations, get in touch with us today and experience unmatched upholstery excellence with Nordby Upholstery and Canvas! With over five decades of unparalleled excellence in the design and manufacture of custom boat covers, interiors, porch curtains, sunbrellas, awnings, and other custom upholstery Brainerd Lakes clients come to us for, we are the name you can trust for all your personalized upholstery needs. If you're in Walker, Crosslake, Nisswa, Whitefish Chain of Lakes, or other surrounding areas, and are in need of expert, dependable upholstery services at truly reasonable prices, you couldn't have come to a better place!